This plant, sometimes known as the Chilean Bellflower, or the Copihue in Chile (where it's the national flower), was one I'd always wanted to try, but it has a bit of a 'reputation' and isn't seen very often (I haven't really tried to see them, but the only ones I have seen in the flesh are my own plants). 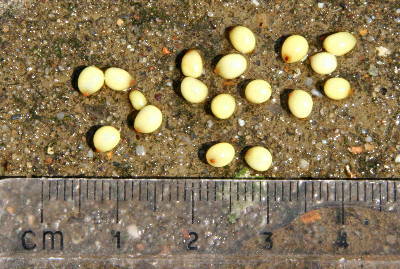 I eventually bought some seeds from Chiltern Seeds, so long ago that I've forgotten when, probably in the mid-1980's. I think I had 5 seeds, which resulted in two plants, which I'm still growing now in 2009. Initially I kept them in my greenhouse, but eventually learned that Lapageria hates full sun and heat (it comes from cool forests). These days, I keep them outside (near Cambridge, UK), which sometimes results in them looking a bit 'tatty' (slugs and snails like the new growth which emerges at ground level, and hard frost can damage any winter flowers). I suppose a non-sunny greenhouse would be the ideal, but how many people have one of those? Old books don't recommend trying them outside in the UK, but it doesn't seem to be a problem - perhaps if you were in a really cold part of the country, then some protection might be advisable. The plant is a twining climber, which I limit to about two metres since it climbs up garden canes in its pot, but it can grow to a great many metres if there's support for it. New stems grow from a 'crown' at ground level, and harden to something resembling thin garden wire! The leaves are tough, shiny, leathery. So it's quite a contrast when the flowers emerge - the first ones this year are on display as I write (July 2009) and I'd expect them to carry on well into winter. There is lots of information on the web, so scarcely a need for me to add more. Lapageria is a lime-hater, so grow in an ericaceous compost (which probably means something with peat in it, unless you are very determined to avoid it). Keep well-watered, preferably with rain water, but not waterlogged. As I said above, the plant hates full sun and heat - new soft growth will wilt, and even the tough old leaves can be scorched. New stems usually emerge at ground level from the 'crown', so beware them being chewed off by slugs and snails. Other than that, it's easy! As I said above, I started my own plants from seed years ago. And two years ago, I bought some seed, with the intention of expanding the range of flower colours (although there's only one species - Lapageria rosea - occasional variants from the standard pink all the way to white occur in habitat, and some of these have been extensively propagated in cultivation. The most important thing, so people say, is to start with fresh seed. Once the seed has been dried out for a while, it can be all the more difficult to 'get going'. The picture on the left shows some seed, extracted from a single seed-pod on the plant above - it's been washed to remove the pulp that fills the seed-pod. I would sow this straight away, using a mixture of peat, grit, and maybe some commercial ericaceous compost (proportions probably not too important). I just cover the seed by about its own depth of soil, and then cover with a layer of grit. Temperature isn't supposed to be all that important - certainly no need for very high temperatures. If I've been sowing the depths of winter, then I've placed the pots in a covered propagator (just to keep the moisture in) in an airing cupboard, but at any other time of year, room-temperature will do (or perhaps a shady place in the greenhouse). They're not quick to germinate - I've raised lots of seedlings now, and my records show that (at least for me) they invariably start to show after between 6 and 8 weeks, achieving near 100% germination shortly afterwards - presumably the root starts to grow sooner, but you don't usually get to see it. The first thing to show is a thin stem, with a single leaf on it. Nothing much happens for a while after that (probably the roots are growing). You are advised to leave seedlings alone, without transplanting, for up to a year. Eventually either the stem resumes growth, and a new stem emerges at the bottom (much as happens in the adult plants). Once the growing stems threaten to get all tangled together, then that's probably the time to move them to single pots, and eventually provide them with a cane to twine up. It is reckoned that you can get your first flowers at around 3 years old. Slugs and snails find the new growth near ground level to their taste, and greenfly can also infest young growth (the older stems and leaves are too tough to be affected). 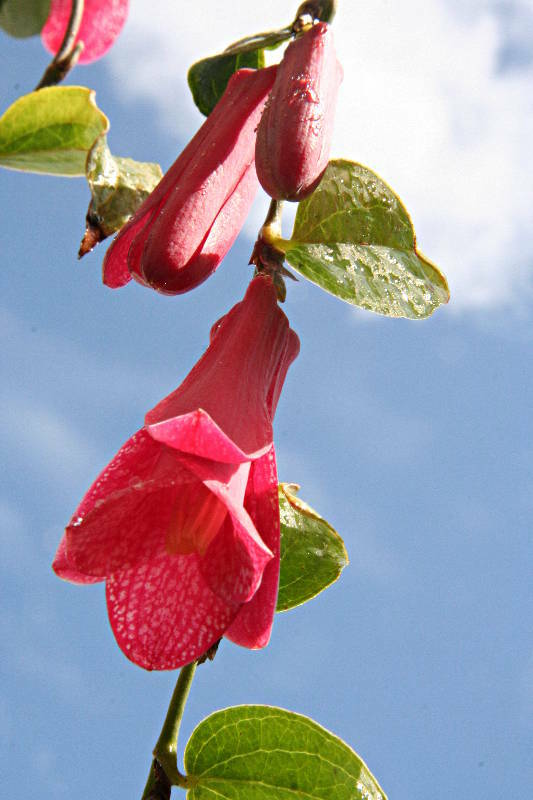 I'd particularly recommend Mike Jeans' page on Lapageria seed-raising. His website seems to have disappeared (2018), but here's a link to a 2017 version on the 'WaybackMachine' archive: TomorrowsPlants. I've bought seed from him myself, and followed his advice.